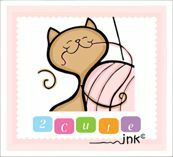 I am so excited to announce that from now on ALL digital stamps released each month in the 2 cute ink digi club will be exclusive! This means you can only get these cuties by joining the club! It is such a fantastic way to get a variety of digital stamps at a discount price. Plus you get a 75% off coupon for my etsy shop that you can use the length you stay in the club! Make sure to join by August 31st to get the promo price of $5 a month.